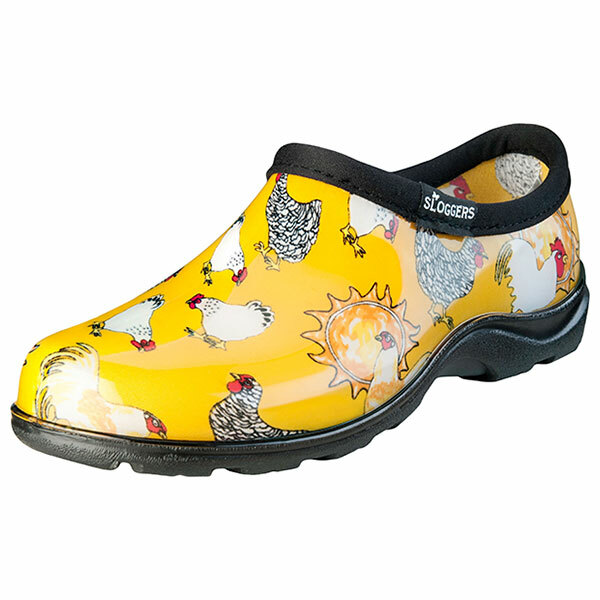 Whether you’re working in the garden, or out-and-about town on a rainy day, you’ll be comfortable, dry and secure in your new chicken print Splash Shoes. You’ll love the slip-on convenience and comfort, the ease of cleaning and secure traction, but most of all, you’ll love all of the compliments coming your way. Just like the rest of our Sloggers MADE IN THE USA shoes, they include our “All-Day-Comfort” insoles, our signature deep lug sole for great traction in wet and muddy conditions, and a soft binding around the top. Our shoes are made from 100% RECYCLABLE, medical grade material, so they have a soft feel, no odour, are easy to hose off clean and will last for years. The sole contains up to 50% recycled material. A beautiful shoe but the sizes are small. I wear a 9.5 and have bought a size 10 in this shoe and it’s still a tight fit. Need an 11, really. These are so much fun and I get compliments on the chickens when I wear them. Great quality and SO comfortable! I can tell I am going to have these for a long time. I am a size 6.5 usually and I bought a size 7 and they are great.